Be a princess… Slay the dragon… Journey through an enchanted forest! In this class the youngest stars will explore creative story-telling, imaginative movement and improvisation in a fun, playful setting. 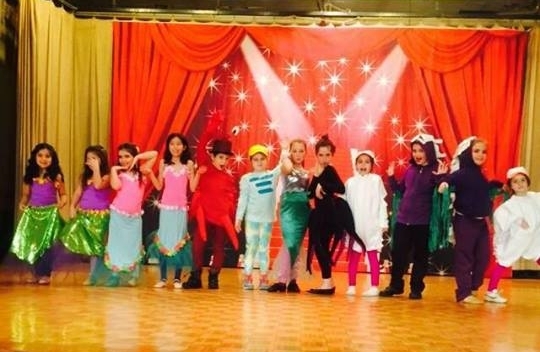 Children learn basic acting techniques and traditions of the theatre while bringing the world of fairy-tales, books and classic literature to life. Past performances include: The 3 Little Pigs, The Frog Prince, Cinderella, and Annie to name a few. Our youngest actors also participate in their very own showcase performance, as well as the company show in the Spring. Young actors learn about characterization and storytelling by singing songs and acting out popular plays and fairy-tales. Take your creativity to the next level and bring the world of your imagination to life. Perhaps you get lost in Oz, take a rocket ship to the moon, or dance all night long with Prince Charming- whatever story you’re telling, the building blocks to confidence on stage are instilled in this class. From Elsa to Cinderella, from trolls to beasts, the cast of characters is endless and so is the fun! This musical theatre class is designed to appeal to young performers and introduce them to the world of musical theatre by using the music and stories of their favorite Disney productions. We will choose a Disney show to perform for our friends and families at our Winter Showcase. A super fun, creative acting class for performers of all levels. Actors work on scene study, voice and body connection, character development and basic principles of acting and theatre etiquette. Using age-appropriate plays and scripts, young actors can explore characters and reinvent themselves. Players work on developing with performance abilities, memorization and confidence in front of an audience. No Experience Necessary; A MUST for any student applying to junior high schools for talent. A super fun musical theatre class for the triple threat performer! Students will learn acting, singing, dancing and how to do all three at the same time! Each class will focus on a specific theme and create an original production for our Winter Showcase. Past performances include: The Little Mermaid, Teen Beach Movie, Bye, Bye Birdie, Mary Poppins, and more. Our very popular Theatre Troupe is now in its 5th season! Actors have performed in various venues such as: Owl’s Head Annual Halloween Event, 3rd Avenue Summer Strolls, 3rd Avenue Festival, BrooklynONE Christmas Extravaganza and more! In addition to performing at local events, Theatre Troupe presents a Holiday show as well as leading roles in our Spring Production. Strict requirements about attendance, line memorization and participation are required. A process-driven acting class focused on the interests and issues involving teens. Through scene study and advanced character development, actors will increase their range and ability to play a wide variety of roles while utilizing material that is fun and relatable. The singing component of this class will teach actors how to use their voice and prepare them for any audition and performance opportunity!